Updated Nov. 3, 10:30 a.m. EST. Things were pretty hectic yesterday. Requests poured in from the users of this site like never before. Furthermore, another major election site was colocated at HostRocket and it had massive traffic too. Add to that another huge distributed denial of service attack far more sophisticated than the previous one (including one on the DNS servers) and the packets were a-flying. I added the biggest multiprocessor HostRocket had available. Then I got on the phone with people from Boston to San Diego pleading "Friends, Romans, and countrymen, lend me your server." I spent an hour moving public keys hither and yon to set up secure, hackproof communication channels between the various servers. But in the end, the whole system was simply overloaded. I had my servers positioned on different LANs but the Ethernet switches couldn't even handle the traffic. The routers were swamped. One of my minor backup servers was putting out 6 Mbps continously Around 4 a.m. my time, when I was typing characters on my main server, it was taking 10 seconds for them to be echoed and have them appear on my screen. At that point I threw in the paper towel. I did try to have live updates, honest. I worked on the problem from about 4 p.m. to 4 a.m. my time nonstop, but it just wasn't doable. My apologies. I'm a bit tired now, but I did type in the preliminary numbers and got the map up. More updates will follow today. The networks are reporting the score pretty well, so I will concentrate on how the pollsters did. 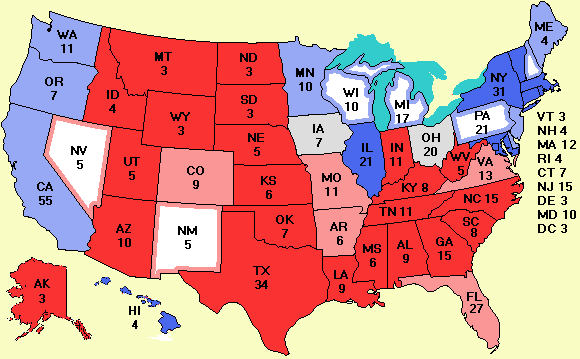 As best I can tell at this point, Bush has 259 electoral votes and Kerry has 252. Iowa (7 EVs) and Ohio (20 Evs) are still undecided, but Bush is leading in both of them. There is a small chance that Kerry might lose Wisconsin (10 EVs) or Bush might lose New Mexico (5 EVs), but probably it comes down to Ohio, where somewhere between 100,000 and 250,000 provisional ballots remain to be counted. One thing that is very strange is how much the exit polls differed from the final results, especially in Ohio. Remember that Ohio uses Diebold voting machines in many areas. These machines have no paper trail. Early in the campaign, Diebold CEO Walden O'Dell, a GOP fundraiser, promised to deliver Ohio to Bush. He later regretted having said that. A comparison of the final polls with the actual results is available in both .xls and .csv format. Columns C-E give the actual vote and columns F-H give the final polling data. Columns I-K give the corresponding differences, where + means the candidate did better than expected and - means he did worse. For example, Bush was predicted to get 57% in Alabama but he got 63%, so cell I2 is +6. Clearly Bush got most of the undecideds in Alabama. In contrast, the final poll in New Jersey was a 42% to 42% tie, yet Kerry won New Jersey easily, 53% to 46%, so cell K32 is 11. Senate news: It looks like the GOP has picked up a couple of Senate seats. Johnny Isakson picked up Zell Miller's seat. David Vitter becomes the first Republican in history to be popularly elected to the Senate from Louisiana, taking John Breaux' seat. Richard Burr picked up John Edwards seat in North Carolina. Jim DeMint picked up Fritz Hollings seat in South Carolina. John Thune knocked off Senate Minority leader Tom Daschle, which will set up a battle for the job of minority leader. In Oklahoma, Tom Coburn (R) beat Brad Carson (D) The Democrats did win a couple though. Retiring Republicans were replaced by Democrats in Colorado and Illinois. Ken Salazar (D-CO) becomes the first Latino senator and Barack Obama is the first black Democratic man elected to the Senate since Reconstruction. Alaska and Florida are still up in the air. It looks like the new Senate will have 44 Democrats, 53 Republicans, 1 Democratically leaning independent, and whoever wins in Florida and Alaska. Incumbent Sen. Jim Bunning (R-KY) barely squeaked by his challenger Dr. Daniel Mongiardo. I expect Bunning to resign after his inauguration for "health reasons," paving the way for Gov. Ernie Fletcher, a Republican, to appoint himself to the Senate. The Senate spreadsheet shows the scores and compares them to the final polls. There is also a .csv version. Again, if you are a senior majoring in computer science and are seriously thinking of leaving the country due to the election results, you might be interested in my international English-language Masters program in parallel and distributed computer systems. If you are a faculty member in computer science, I would be very grateful if you would go to that Website and download and print the poster (a PDF file) and pin it to a bulletin board where potential students might see it and mention it in any classes you teach to CS seniors. Thank you.